Before the outdoor viewing parties, communities stocked up on eclipse glasses (for safe viewing). Other communities held events for viewing a broadcast of the eclipse in their theater rooms. There were a variety of creative snacks and activities planned as well. Arbor Terrace of Burnt Hickory in Marietta, Ga., hosted events all day, beginning with a Solar Eclipse Social early in the day and a “Moon and Sun Mixer” in the late afternoon. Arbor Terrace Middletown and Arbor Terrace Shrewsbury in New Jersey teamed up for a joint “Great American Solar Social.” Shrewsbury residents traveled to Middletown to watch the eclipse in the courtyard, while enjoying Blue Moons & Moon Pies. Arbor Terrace of Knoxville, Tenn., had a party and viewing with festive solar eclipse t-shirts for the residents and staff, and an eclipse cake for a post-eclipse party. 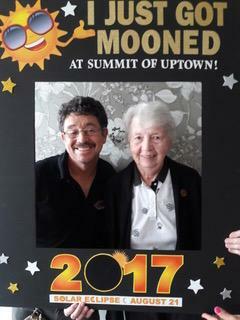 An Eclipse Viewing Party at Arbor Terrace of Athens, Ga., included moon pies, Sunny Side cookies and Blue Moon punch. Eclipse viewing glasses were available for residents and family members. Arbor Terrace Peachtree City, Ga., had a Blackout Party. Staff members will pass out glow sticks and glow necklaces; attendees were urged to wear all black clothing to better show them off! Residents gathered at the pool deck for a viewing. Arbor Terrace Sudley Manor in Manassas, Va., held a Solar Eclipse Watch Party, joined by seniors from a nearby independent living community. The group enjoyed live music with Adam Melia, refreshments, raffle prizes, Solar Bingo, and a countdown to the eclipse. Eden Terrace of Spartanburg, S.C., had an Eclipse Party with a short talk about the science behind the eclipse, along with moon pies, Sun Chips and cool glasses of Tang! Summit of Uptown Park Ridge projected NASA’s live stream on a big screen while residents enjoyed Blue Galaxy Cocktails, Sunkist Lemonade, Milky Ways, Sun Chips with Eclipse Dip and Black and White Cookies. They viewed the partial eclipse with cool NASA-approved glasses.